FaxSee Pro is a fax viewer browser and fax to tiff converter, able to browse open view print FaxWizard fmf, WinFax fxd fxm fxr fxs, black-white dcx bmp tiff, APRO MightyFax apf, BitFax bfx, CALS cal img mil gp4 oda ras, Zetafax g3f g3n, DIGI-FAX g3f, Image Systems IG4, awd, qfx, Kofax Ascent Capture DS, Edmics-mmr ED, other group 3 (T.4) and group 4 (T.6) compressed fax like mr mmr g3 g31d g32d g4 raw fax, etc, and convert fax to tiff. ...... 4) and group 4 (T.6) compressed fax images such as gtx, zgf, smp, raw, g3, g31d, g32d, g4, mh, mr, mmr fax, etc, and able to convert ALL these fax files into tiff images. FaxSee Pro enables you to browse your fax images in thumbnail viewing mode with tooltips, and operate the fax image with shortcut menu in single viewing mode. FaxSee Pro supports more fax formats than Smart FaxSee. FaxSee Pro has more features than smart faxsee. 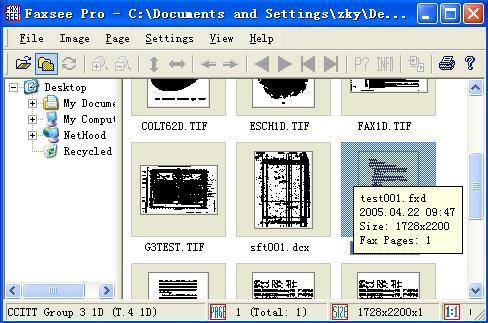 open and view Fax Images: you can open fax images of almost ALL kinds of fax images with faxsee pro, such as black-white tif tiff fax, fmf, fxd fxm fxr fxs, black-white dcx bmp, bfx, qfx, apf, img cals cal cg4 gp4 mil oda ras, awd, g3f g3n, ig4, ds, ed, g3, g31d, g32d, g4, mh, mr, mmr, raw, fax, etc. (See FAX formats supported by FaxSee Pro), and shows detail information of the fax file. Fax image browser viewer & fax to tif tiff converter. A smart and professional fax image viewer & fax to tif tiff converter . open view convert tiff fax fmf fxd fxm fxr fxs dcx bfx apf g3f g3n awd qfx raw..
Qweas is providing links to FaxSee Pro 3.01 as a courtesy, and makes no representations regarding FaxSee Pro or any other applications or any information related thereto. Any questions, complaints or claims regarding this application FaxSee Pro 3.01 must be directed to the appropriate software vendor. You may click the publisher link of FaxSee Pro on the top of this page to get more details about the vendor.